Q: In the afternoon of March 22 local time, a terrorist attack happened near the British parliament, killing 5 people and injuring more than 40. What is your comment? 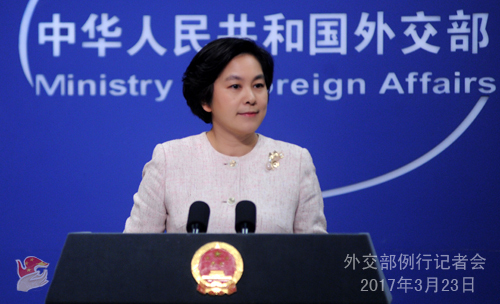 A: China strongly condemns the terrorist attack happened yesterday in London, the UK. We express our deep condolences to the innocent victims and sincere sympathies to the bereaved families and the injured. President Xi Jinping, Premier Li Keqiang, and Foreign Minister Wang Yi have respectively sent messages of condolences to the British side. Terrorism is the common enemy faced by all countries in the world. China firmly opposes all forms of terrorism, and would like to work with the international community, including the UK, to enhance cooperation, jointly meet the threats and challenges posed by terrorism, and preserve world peace and security. Follow-up: is there Chinese citizen injured or killed in the attack"? A: The Chinese Embassy in the UK activated the emergency response mechanism upon learning the attack and issued a consular alert on the website of the embassy. Up to now, one Chinese tourist sustained minor injuries in the attack. We will continue to follow the development closely and properly deal with the follow-up matter. Q: The Bangladesh central bank's account at the Federal Reserve Bank of New York lost USD 81 million last year. The US federal prosecutors suspect that the DPRK directed last year's theft and Chinese middlemen offered help to the DPRK government. The US is investigating into this case. Do you have more details? What is your comment? A: I have seen these reports, but I am not aware of the details. What I can tell you is that the Chinese government attaches high importance to fighting serious crimes, including cyber crimes and stands ready to enhance cooperation in these fields with relevant countries. This position is consistent and clear. Q: The US Congress is seeking a sanctions legislation calling for cutting off crude oil imports from the DPRK, and companies violating the rules are also subject to sanctions. Some analysts say that the sanction measures may be targeted towards China. What is your comment? A: We have repeated China's perspective on the situation of the Korean Peninsula multiple times. We believe that in light of the tense situation there, relevant parties should remain calm, exercise restraint, and do more to alleviate tensions, instead of the opposite. 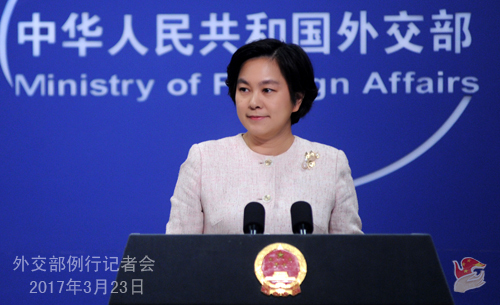 China has been earnestly and strictly implementing the DPRK-related resolutions of the Security Council in full. Meanwhile, we oppose any country levying unilateral sanctions against others in accordance with its domestic laws. As we have said, while levying sanctions is a way of implementing resolutions, considering that relevant resolutions also explicitly call for a resumption of the Six-Party Talks, we believe promoting talks with all-out efforts against the current backdrop is a way of implementing resolutions as well. We hope that all parties would faithfully, strictly and earnestly implement the DPRK-related resolutions of the Security Council in full. I also want to repeat that sticking to sanctions and pressure solves no problems as proven by facts while dialogue and consultation points a way out. The Korean peninsula issue is intricate and complex. It dates back a long time ago. Only by accommodating the security concerns of all parties can the Korean nuclear issue be resolved in a fundamental way. We hope that all parties can give serious thoughts into China's proposal of "dual-track approach" and "suspension for suspension". Q: It has been a year since the Langcang-Mekong Cooperation (LMC) was officially launched. What has been achieved by the LMC mechanism over this period? How will China move forward the LMC? A: The LMC is a new-type mechanism for sub-regional cooperation. China and Mekong River countries jointly plan and build this mechanism and share its benefits as well. As we all know, on March 23, 2016, the first leaders' meeting of the LMC gathered Premier Li Keqiang and leaders from Cambodia, Laos, Myanmar, Thailand and Vietnam in Sanya, Hainan to launch the LMC mechanism. Over the past year, we have established a multiple-layer cooperation structure including leaders' meeting, foreign ministers' meeting, senior officials' meeting and working groups' meeting and a "3+5 cooperation framework", referring to the three cooperation pillars -- political and security issues, economic and sustainable development, and cultural and people-to-people exchanges -- and the five key priority areas of connectivity, production capacity, cross-border economic cooperation, water resources, and agriculture and poverty reduction. More than half of the 45 early harvest projects and initiatives reached on the first leaders' meeting are either fulfilled or still underway. The setup of joint working groups for priority areas is moving forward steadily. Financing has been offered to various sectors. These daily progress and monthly achievements best explain what "Lancang-Mekong speed" and "Lancang-Mekong efficiency" means. At present, the six countries have formulated a road-map for future cooperation, agreeing to establish the LMC Secretariat or coordinating organization in six countries and complete 45 early harvest projects within the year. In the first half of this year, joint working groups on key priority ares will be up and running. In the second half, the third foreign ministers' meeting on the LMC will be held to prepare for the second leaders' meeting scheduled to be held next year. The six countries will also create an LMC five-year action plan and announce the second batch of cooperation projects. China attaches high importance to the LMC. Following a neighborhood diplomacy of amity, sincerity, mutual benefit and inclusiveness, China would like to work with sub-regional countries to cultivate the LMC culture, forge the LMC corridor and build a community of shared future for the LMC countries. The LMC will contribute to the ASEAN community building and promote sub-regional stability and prosperity. It will become a flagship mechanism for the building of a community of shared future for Asia. Not too long ago, Foreign Minister Wang Yi and diplomatic envoys stationed in China of the other five countries jointly attended the launching ceremony of the LMC China Secretariat. A Wechat account for the LMC was also opened for everyone to keep close tabs on the latest LMC news. Q: According to the US media reports, after the botched missile launch by the DPRK, a US bomber, en route to the ROK for drills, entered into China's ADIZ in the East China Sea. What is your response? A: I haven't heard of it and knows no details. I would refer you to the military. We hope that relevant countries can do more for regional peace, stability and security. Q: The US military said that its B-1 bomber was warned by the Chinese side when flying 70 nautical miles southwest of Jeju, the ROK. It was asked to leave the Chinese airspace immediately. The US side said that the bomber was doing normal training with Japanese and ROK military planes in the international airspace at that time, without deviating from its flight route. The US military also said that the US has never acknowledged China's ADIZ in the East China Sea, and never will do so. What is your response? A: I am not aware of the details. You need to check with the military. In principle, we hope that when relevant countries decide to do something, they need to consider the security concerns of other regional countries and whether their actions will help promote mutual trust and regional peace and stability. As for the ADIZ in the East China Sea, China's position is clear. It is the legitimate right of a sovereign state to demarcate ADIZs. The US, who also has its ADIZs, should respect the right of other countries to establish ADIZs. Q: It is reported that Thai Prime Minister Prayuth and Philippine President Duterte had a meeting on March 21 in which the two sides stressed the necessity of fully and effectively implementing the DOC and pledged to striving for a completion of the COC framework. What is your comment? A: With the concerted efforts of China and the ASEAN countries, the situation in the South China Sea is improving towards greater stability. Parties concerned have returned to the right track of resolving disputes through negotiation and consultation. The DOC is being implemented in a comprehensive and effective way. The first draft of the COC framework has also taken shape. Relations between relevant countries are improving. China feels heartened by all these. The 20th Joint Working Group Meeting on Implementing the DOC will be held in Cambodia from March 29 to 30. Together with the ASEAN countries and on the basis of fully and effectively implementing the DOC, we are committed to strengthening maritime practical cooperation, actively move forward consultations on the COC, and formulate a set of regional rules acceptable to all. We will strive to complete consultations on a draft "COC" framework by mid-2017 under the condition of no outside disruptions. Q: Japan's largest carrier-class helicopter destroyer of the Maritime Self Defense Force, the Kaga, entered service on March 22. Japanese Vice Minister of Defence said China is attempting to altering the status quo in the South China Sea through island-building, raising concerns among the international community. Japan has boosted overseas force projection capability with the Kaga to deal with China's increasing influence in Asia. Some Japanese media even claimed that it showed the real strength of Japan. What is your comment? A: First of all, Japan does not make an international community. With the concerted efforts of China and the ASEAN countries, the situation in the South China Sea is improving towards greater stability. China and its neighboring countries will not allow some people in Japan to muddy the waters even if they wish to. Second, Japan has been exaggerating "China threat" so as to find or cook up reasons for its increase in military weaponry. Due to historical reasons, the international community, especially Japan's Asian neighbors has been following closely Japan's moves in the military field. We have every reason to be on high alert for Japan's moves and its real motives. I also want to add that the Kaga was sunk by the US military during the WWII. Japan should learn from that history. We hope that the reappearance of the Kaga will not be the resurrection of Japan's militarism. Q: Tonight in Changsha, football teams from the ROK and China will compete against each other for the World Cup Qualifiers. Reports say that China has put in place a large police presence. Is that true? Is it because of possible conflicts between the two sides in light of the current China-ROK relations? A: You need to ask competent authorities for the details of the football match. As the host of the match, we certainly hope that the match can go smoothly and safely. The Chinese government always protects the safety and legitimate rights and interests of foreign institutions and personnel in accordance with law. We believe that the organizers will take necessary measure to ensure the order of the match.